Support this site by clicking the pic to buy your tickets. Right off the bat, the 3D effects and visuals immediately stand out as bright spot for this movie. 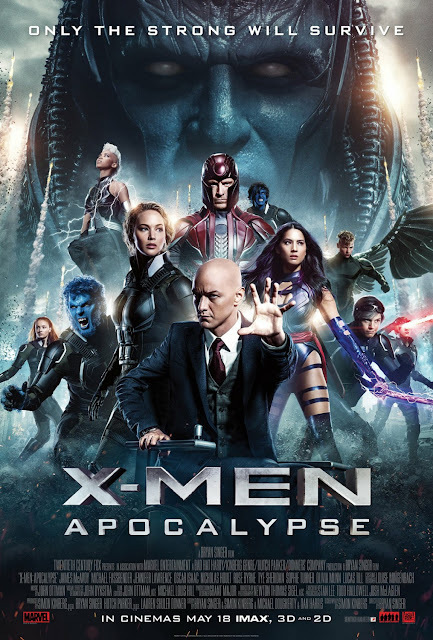 The story was also nice and fitting with the previous X-Men movies, First Class and Days of Future Past. All of the past story lines connect and make sense which makes all three films feel like one big continuous film. If you watched the previous movies, you'll pick up on many of the references that are dropped throughout. It's very easy to say that Michael Fassbender provided some of the best acting in this film. You could connect and feel every ounce of his emotions through his performance. Surprisingly, there were some rather dark, emotional moments in the film that did very well in enriching the characters. This wasn't left to just Fassbender's character alone, but also to that of Cyclops (played by "Tye Sheridan". There was also some interesting moments with Jean Grey's character (played by "Sophie Turner ") that fans of the series will more than likely appreciate as well. Oscar Isaac was exceptional as Apocalypse. He was dark, intimidating and powerful. He felt like a genuine threat to the world given his abilities. To my surprise, this movie was rather violent and somewhat graphic. Even though it is PG-13, it still managed to push the limitations just a bit. However, while it was violent, and took on such a serious tone, it still found time to bring in a little fun. We can thank Quick Silver (played by "Evan Peters") for that. Just like in the past films, he managed to bring in the comic relief. There was a lot of excitement to see Olivia Munn play Psylocke and Alexandra Shipp play Storm. Unfortunately, they each probably had a total of maybe 20 lines combined between the two of them. It was rather disappointing to feel as though we had seen their best in the trailers. At the end of the day, X-Men Apocalypse was really just more of the same. I guess you could just think of it as being The Hunger Games w/ Mutants. There wasn't anything significantly different or epic to make this movie stand out from the rest. It's not a horrible movie, but I'm not sure I'd say it is the best. It's in their top 3, possibly. 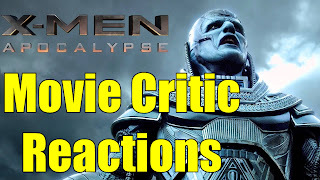 I still think that X-Men Apocalypse was a good movie, despite my grievances. I should probably also note, that I don't entirely blame Jennifer Lawrence for the Mystique portrayal. I think that's more on Director Bryan Singer and the Fox Studio execs as a whole wanting to do a money grab with her since Hugh Jackman is leaving. 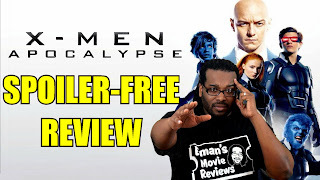 I've been a fan of the X-Men franchise for a while, so you can take my critique with a grain of salt. I have never been a fan of the push of Mystique as the reluctant hero. We all know that this is only the case because it's Jennifer Lawrence playing the part. I would've been okay if they had cast her as Rogue instead... maybe. (At least then they wouldn't have to completely revise the stories and characters). Now, before I get labeled as some misogynistic, sexist film critic, let me explain. IF Fox was really concerned about making a female hero, why didn't they highlight a character like Storm? A BLACK...WOMAN...(that's two wins right there) who actually was a leader of the X-Men. 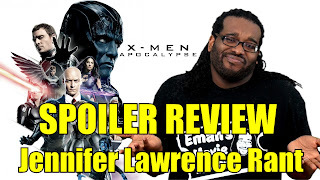 My bigger problem with Jennifer Lawrence/Mystique is that her character revision completely over shadows the issues and themes that made X-Men so relevant and timeless. The focus on her as a single hero, nullifies the X-Men's concept of being a team. Even worse, her character's emphasis undermines the racial themes that the X-Men franchise used to tackle. While it wasn't a matter of "black vs white", the "Mutants vs Humans" basis was a mirror reflection of the civil rights movement. Both Professor X and Magneto's characters were based on the ideologies of Dr. Martin Luther King Jr. and Malcolm X. I think it's unfortunate that rather than using this franchise to bring attention to a relevant social issues, this Mystique hype waters down to a more one dimensional, cliche', hero story. Maybe this wouldn't be an issue if Fox decided to just do a Mystique solo film, but to use the X-Men franchise to guise this Hollywood romanticizing of Jennifer Lawrence is a bit too much for my liking. Feel free to watch this in 3D. Parents please be advised that this isn't the most kid friendly movie. There was at least one F-Bomb dropped, and as mentioned the violence does push the PG-13 boundaries a bit. Go in with low expectations so that you can get the most out of this film. Don't be in a hurry to leave either because there's one end credit scene to see. Enjoyed this review? Share it and let me know what you thought.